The ever popular Doc Yard’s Secret Lab returns again this year. This takes place from 6th to 20th April. 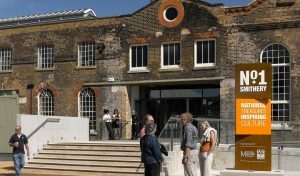 This event has taken place over the last 5 years and was developed to stimulate family learning for Science, Technology and Engineering – all things the Historic Dockyard Chatham was renowned for during its operational period. Get your vocal chords warmed up and ready because this year’s Secret Lab is all about sounds. This year Doc Yard has set off a nuclear submarine and left Bunsen with several experiments that explore the use of sound. Bunsen will of course need the help of visitors to The Historic Dockyard Chatham to complete the experiments. You’ll get to see some of Doc’s favourite sound experiments with a demonstration by Bunsen in an interactive 20-minute experience. After checking that the audience are loud enough, visitors will be allowed into the sound laboratory for some interactive science fun. Will they be able to have a conservation with someone through a drain pipe? During their time in the Lab, visitors will learn how the Royal Navy built ships like HMS Cavalier and the HM Submarine Ocelot. You can even go on board these ships afterwards to see the scale of the challenges put into context. Singing Bowls – can you make a bowl sing? Hammer & Anvil – would you make a good smith? Battle ropes – make the loudest noise you can! On arrival at the Lab you’ll want to warm those vocals up! Once you’ve helped Bunsen with the experiments, families will be able to pick up their special Easter trail that will see young explorers hunt for the sounds of the Dockyard. All this is included in the cost of entry to The Historic Dockyard and tickets are valid for 12 months, allowing visitors to enjoy the site and family activities throughout the year. Note: To enter the Secret Lab you will need a timed ticket. This ticket is FREE but you need to get this from the “Plan Your Visit” desk upon arrival. You will be given an arrival time for your session at the Secret Lab for a 30 minute experience. Sessions are from 10.30 am to 5 pm. These can be booked upon arrival only and not online.